Step 1) From the “Manage Auctions” page, click the green plus sign to show the sub options. Step 2) Once the auction is Archived, you will see a new option to “Delete Auction”. 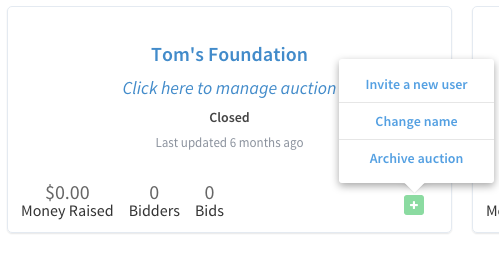 Step 3) Click on “Delete Auction” to completely remove the auction and all the data associated with the auction.